After seven years of thought and research and four years working on writing it, I decided I needed to celebrate the recent completion of Lilith: Healing the Wild. Numerous drafts of the opening chapters were researched and written, and to tell you the truth I was not sure this book would ever let itself get completed. In those four years I’ve written or channeled and published ten books, but this was the first one conceived. So it’s a big deal for me that it’s done – a bit of celebration is in order. Given that Lilith within each of us when healthy is in tune with the physical body and answers its calls, I knew I wouldn’t be going out to celebrate and having something Mexican with a margarita. Lately I’ve been doing a sort of Tucson Mexican restaurant tour and not really feeling that great as a result. I don’t eat out often and lately have been eating mostly raw at home but I’m not really consistent and when watching myself having a margarita, etc., I always stop to ask myself what I’m doing. Lilith asks us to be open to sense and then heed the messages of the body. During the Mexican restaurant tour I most definitely have not been listening to mine! The brain and the mouth are what many of us tend to listen to regardless of the requests of the body, and that is what I’ve been doing. My brain says, But there are so many wonderful places! Who knows what you’ll find? You’ll have a good time and, you know it’s true, you looove margaritas. Lilith energy and consciousness relates to our lower three chakras, which carry certain primal vibrations based in reactions to stimuli. Lilith within us when flowing and free pays attention to what we’ve got going on in our lives and attempts to stir us to move toward what works and to edge away from what doesn’t work. That stirring doesn’t come via a thought but through sensations in the body – discomfort, recoiling, constriction, and closing for the negative and opening, warming, flowing, and magnetizing for the positive. All who eat what our bodies might not want or need know the feeling of going against the body. But it’s actually that we’re going against the wisdom of the body. It is innate and reflects that our bodies are essentially extensions of the natural world. We are not minds that happen to have bodies or bodies that are fortunate to have minds – we are complex organisms made up of inter-related systems that are all based in the physical body. An awareness of Lilith within helps keep all of that functioning smoothly because our instincts are fully outfitted to guide us to what we need. Not what we think we need but what we actually need. It’s easy to overlook instinct and yet that is what Lilith is all about. If you’ve heard of her you’ve likely heard that she’s the mother of all demons. There are many warnings about knowing Lilith and – heavens forbid! – acting like her. The new book takes apart the myth we have received – which is about instructing us how to be the right kind of people in patriarchal cultures – and delves deeply into the archetype to offer a new vocabulary and context when it comes to Lilith. 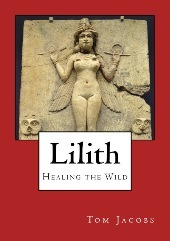 The subtitle “Healing the Wild” points to the fact that when we honor Lilith within us we are in touch with nature within us. And that connects us more to the natural world around us. When it comes to messages from the body, Lilith offers us feedback on what is right for us and when. To celebrate the completion of the book I decided to begin a modified juice cleanse/fast in order to reset the food button in my world. I recognize that my mind and mouth are habituated to want certain things and it’s important to me to be healthy and, as mentioned above, I am not always consistent. But I was going to begin it tomorrow. This morning I sensed in my body that today was the right day to begin. My brain went through a process of trying to reason with it but my body was set. It knew precisely what needed to happen today – the signal was clear and strong. This is a critical point when it comes to Lilith: We might not always understand why the body calls for what it does and, as a result, we have trained ourselves out of listening to our bodies. But they do not speak unless they need to – unless we need to hear what they have to say. We tend to be mind-centered to the point that we let our ideas, preconceptions, biases, and beliefs determine everything in our lives. Lilith invites us to reconnect with instinct in order to be more whole even though it can complicate things somewhat for the mind. She asks us to come out of conceiving of ourselves as minds that happen to have bodies. She asks us come back into balance with all sides of our being through honoring our physicality because it connects all parts of us together. And it is true that the body is always offering us feedback about our choices and beliefs – health issues manifest as a direct result of the energies we carry in the form of thoughts and beliefs. But do we listen? Are we willing to do so? Choose not to judge yourself for not listening. But make a self-interested commitment now to explore listening more to your body and the innate wisdom of the natural world that it carries. I know with certainty that I will be better off from this cleanse. But my mind wants to control everything and of course offered doubts – doubting and resisting everything natural has for many people on Earth become the mind’s job. Getting to know Lilith asks us to be in our bodies in order to be whole, which creates health on all levels. This is to say that doing this cleanse will be good for me not just physically but in all other ways, too – mentally, emotionally, and spiritually. This is not my first cleanse. I know what to expect and how to deal with detox symptoms. So that helps to some degree my mind to get on board with doing it, which it now has. I feel aligned with what my body needs and my Lilith is happy. My job now is to remain aware of what is happening and respond in clear ways that serve me on all levels. We’re ready to look Lilith in the eyes and be willing to see her within us and celebrate the fact that we are extensions of the natural world. Developing a relationship with our bodies based in respect, honor, and frankness creates room for the natural wild feminine in our lives and, therefore, the world. I will sign Lilith: Healing the Wild paperbacks ordered through my site. I am also offering a PDF e-book at the same link. The book is also available through Amazon and Kindle in the US and Europe. Tom Jacobs is an Evolutionary Astrologer, Medium, and Channel helping you understand and do what your soul came here to do and give you insights into and tools for healing and making it happen. Eleven books, two original natal reports, and numerous astrology and channeled MP3s are available through tdjacobs.com. Join Tom Jacobs when he channels Ascended Master Djehuty for a Full Moon Grounding & Release call for the Sagittarius Full Moon to release beliefs you no longer need so you can be more fully present and in compassionate charge of your life.